This two-day training is aimed at professionals who have an intermediate/advanced knowledge of CBT and are looking for an evidence-based, manualized program on adapted CBT for children and adolescents with ASD to address the high levels of anxiety in this population. Research has shown that children and teens with ASD and anxiety demonstrate significant reductions in anxiety following participation in modified Cognitive Behavior Therapy (CBT) interventions, allowing many to function better at home, school and in the community. Facing Your Fears (FYF) is a group CBT intervention for managing anxiety in youth with ASD. 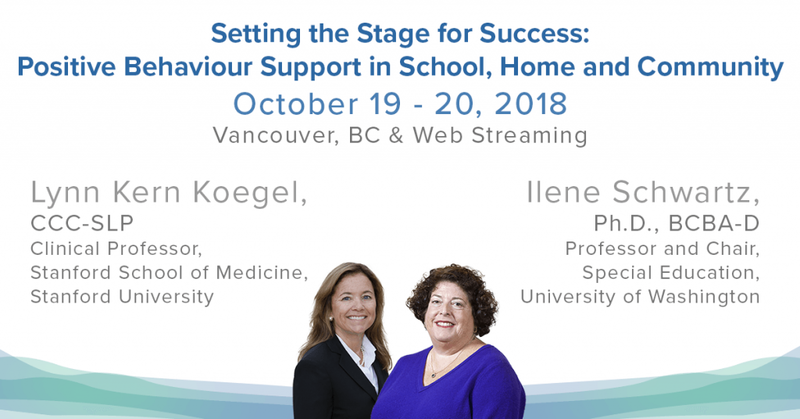 Throughout the training, participants will learn about FYF, identify core components of the clinic based FYF program, learn how to modify FYF for teens with ASD and intellectual disabilities, as well as strategies for delivering FYF in school settings. Video examples and interactive small group activities will be provided throughout this training, provided by Dr. Judy Reaven, one of the developers of the FYF approach. Dr. Reaven is an experienced clinician and researcher and is a dynamic presenter. Along with the resources on ACT’s School-Age Children with Autism page, you can find hundreds of resources on our B.C. Community Resources search and the Autism Information Database. Enter your city or postal code to narrow down service providers, recreational activities, employment and training opportunities, and community organizations near you. Find articles, guides, videos, and research on executive functioning skills, anxiety, bullying, and much more. Enter now for a chance to win 1 set of 2 tickets to see a relaxed performance of The Curious Incident of the Dog in the Night-Time, a Tony Award-winning play adapted from the novel by Mark Hadden, about a teenager with high-functioning autism seeking to solve the murder of a neighbour’s dog. Visit the Arts Club website for more information on this play. This relaxed performance is an inclusive, modified theatre experience designed to welcome people who may find it difficult to follow the usual conventions of traditional theatre. How to win tickets: Email info@actcommunity.ca with the subject “The Curious Incident of the Dog in the Night-Time Give-Away” before Friday, September 14 at 9:00am. ACT will randomly select the winning entry to receive a free set of 2 tickets to see the play and will email ticket winners with instructions for pick-up at the theatre box-office. Click the button below to send your email and be entered into the ticket giveaway. This entry was posted in ACT Resources, Autism Information Database, Education and Training, Events, News, News Round-Up, Non-ACT Event on September 11, 2018 by ACT. The Ministry of Children and Family Development has just released information for parents and professionals on the upcoming transfer of individualized support and RASP services from ACT to MCFD. View MCFD’s full information releases: Transitioning Information and Support Services to MCFD. ACT is refocusing our work in 2017 to concentrate on training and information resources to ensure that the autism community continues to have access to evidence-based, community-focused information and training. Live events – available both in-person and via web streaming; bursaries available. Autism Videos @ ACT – nearly 30 free online video. Autism Information Database – over 1,000 vetted information resources related to ASD, and other special needs, in multiple languages. During this time of transition and transformation, your financial support would be greatly appreciated. We know that families and professionals have many demands on your financial resources; ACT is approaching foundations and seeking sponsorship. As a federally registered Canadian not-for-profit society, ACT can provide tax receipts for donations over $10. ACT’s Charitable Tax Number is #861691236RR0001. ACT is hosting a number of live and online training this summer and fall. Register soon to ensure your seat and take advantage of early bird rates. Thank you to our sponsors and speakers who make ACT’s training possible. MCFD has provided ACT with funding for a bursary program for parents and caregivers of children with autism to attend ACT events at reduced registration rates ($25 a day*) until March 31, 2018. Seats will be filled on a first come, first registered basis. Each parent is eligible to receive one in-person event bursary up until March 31, 2018. Additional bursaries are available to register for web streamed events. *Learn more about how to register using the MCFD event bursary program. ACT continues to offer bursaries for para-professionals and professionals to improve accessibility to both our live and web streamed events. Please apply early and before you register for the event. July 31 – Aug. 4 – Surrey – only 2 spots left! (CEUs for BCBAs and BCaBAs are available. See event page for details). Popular ACT speaker, Dr. Fossett is the presenter in the ACT video Positive Behavior Support: What Parents Need to Know! The BC professional community has responded with a dramatic increase in the number of applications to the RASP – up over 78% over the first five months of 2017 as compared to the same period in 2016 – in response to ACT’s call to submit applications before the handover to MCFD (June 30th). ACT’s staff has been working intensively to process these applications, to ensure families have access to as many professionals as possible – approvals are up 88%. RASP service providers leave the RASP due to retirement or moving to a different job or province. Since April 30, Margherita Jessa, and Laurie Patrick have been removed from the RASP. Reminder: New RASP Applications will be given to MCFD for Processing in July. ACT will hand over the management of the Registry of Autism Service Providers to MCFD as of June 30, 2017. ACT advises that all new applications will be given to MCFD for processing in July. The RASP application process will remain the same after July 1st as it is a MCFD-regulated process, which ACT has managed on MCFD’s behalf since 2005. For more information on the RASP application process see: www.actcommunity.ca/rasp/sp-info/ Early Years Professional Development Web Portal The Provincial Office of the Early Years has developed the EYPD web portal earlyyearsbc.ca. You can search for training events, post your own event, sign on to the Science of Early Child Development and more. Anyone working with young children can now find, plan and schedule professional development in the early years sector. For more information. Post your community events, and reach a new audience. This listing is a popular part of our monthly newsletter, which reaches over 7,300 people a month. The June Edition of the Kamloops Self Advocate Newsletter for people with Diverse Abilities and their parents in B.C. is available now! Publisher Krystian Shaw is looking for contributors for upcoming issues. For more information see selfadvocatenet.com/kamloops-self-advocate-newsletter/. The Autism’s Own Conference is organized by people on the autism spectrum in Victoria. This year the theme is Conversations on Autism over the Lifespan and there will be panel discussions, musical and theatre performances and artistic displays. For more information see the ACT Special Needs Community Events Calendar. If you know of more self-advocate resources, please submit to info@actcommunity. The results of the survey will be used to inform research and knowledge translation priorities for Kids Brain Health Network over the next several years. The survey is available online until June 30, 2017. AID resources available on romance, puberty, health, self-care, and sexuality. The need for GPs (family doctors) to receive proper training in autism is not unique to Canada, according to this article in a UK paper: GPs urgently need training on autism (the Independent). Create a Medical Profile form (developed in collaboration with BC Children’s Hospital) to help family communicate effectively with emergency departments. Mental health is a major concern for the autism community. The Online Mental Health & Autism Project provides two presentations, available for free online, with more planned for later this year. Looking to upgrade your skills or seeking professional certification? ACT lists B.C. Post-Secondary Programs for Professionals on our website. Capilano University and Douglas College are taking applications for programs that begin in September 2017. The Invention and Reinvention of Autism: Researching ASD Across Cultures. Presented by Dr. Roy Richard Grinker, Professor at George Washington University and author of Unstrange Minds –Remapping the World of Autism. The Essentials of Advocacy: A Parent’s Guide to Advocating for their Child with Special Needs. Presented by Deborah Pugh, Executive Director of ACT – Autism Community Training. This entry was posted in ACT Resources, Autism Information Database, Education and Training, Events, fundraising, News, Non-ACT Event, Online Videos, RASP news on June 2, 2017 by ACT. Looking for camps for your child with autism? Search the AID – type in “Spring Break Camps” in the Community Resources search box. Or, for more individualized support, email info@actcommunity.ca or call 604-205-5467 or 1-866-939-5188 to talk to an Information Officer. This entry was posted in Autism Information Database, News on March 3, 2017 by ACT. ACT’s staff and board thank all those who continue sending kind comments via Facebook, email and by telephone. It has been an honour for us to provide navigation and information services to families and professionals across B.C. since 2005. When we have information to share with the autism community from B.C.’s Ministry of Children and Family Development on their new vision of service provision, we will post it on our website and Facebook page. In the meantime, ACT is continuing to provide our always friendly and efficient service as we work to re-design our programs – details below. ACT’s Live Event Calendar for 2017 – Registration Now Open! ACT is finalizing the details of our 2017 event calendar. At ACT’s live events, leading practitioners and researchers from across the world share their insights with B.C. parents and professionals. Join us for inspiration and information! See below for the events which have already been confirmed. Special thanks to our sponsors and speakers who make ACT’s training possible. SFU Harbour Centre – Vancouver. Mental Health is the focus of this year’s Focus on Research conference. We are delighted to announce our two keynote speakers, Dr. Christopher Gillberg (University of Gothenburg, Sweden) and Jonathan Weiss (York University, Toronto). ACT’s Online Mental Health and Autism Project committee will finalize the program over the next two weeks – save the dates for what will be a thought provoking two days! Details & registration coming soon. The events below are open for registration – register early and save! ACT has added five new videos to AVA since the beginning of December 2016. This week we launch a new platform to make this free resource easier to navigate as we now have over 20 videos and we want to make sure our users don’t get lost! Take a look at our new Videos home page which allows you to easily scan all our video offerings and view them when convenient to you, with no passwords. This is a free service made possible thanks to donors, sponsors and of course our presenters, who donate their time to this rich source of evidence-based community training, available internationally to all who need access to positive information on autism and other special needs. This free online ACT video provides practical, positive guidance on how to navigate various government systems that control access to services for children with special needs. ACT is considering how we can fund the Autism Information Database as MCFD has indicated that they will not maintain this resource. The AID now has over 2,000 information and community resources carefully sourced from across B.C. and internationally. It is the only key-word searchable, non-commercial, multi-language resource of its kind internationally and we would like to continue it as an important resource for the autism community, nationally and internationally. Email dpugh@actcommunity.ca with any suggestions for sources of corporate/foundation funding. As a federally registered not-for-profit society, ACT can provide tax receipts for donations over $10. ACT’s Charitable Tax Number is #861691236RR0001. Individual donors and sponsors are listed on our donations page; thank you for contributing to world-class live and online training. ACT is preparing to hand over the management of the Registry of Autism Service Providers to the Ministry of Children and Family Development as of June 30. In order to minimise delays for those planning to apply to the RASP, and to provide an efficient transition, ACT advises that all applications be submitted before May 1. Those applicants who fulfill the experience and coursework requirements, and have full documentation to support their applications, including references, will be processed by May 30th. ACT will not be accepting new RASP applications after May 15th. Twelve RASP professionals have been added or had their status updated since December 31stth. As of January 26th, 2017, there are 669 professionals on the Registry for Autism Service Providers: www.actcommunity.ca/rasp/search/. RASP service providers leave the RASP for many reasons including retirement or moving out of province. No service providers were removed in January 2017. RASP providers are urged to keep their contact information up to date either online or by contacting the ACT office. The RASP Service Providers page has information for new applicants; the criminal record check process and renewal and professional development. Each year, Autism on the Hill holds a rally at the Parliament buildings in honour of World Autism Day. They are asking family members, caregivers, and people with autism to send in pictures to go on their banner to raise awareness of the diversity of Canada’s national autism community. Submit your photo. Canucks Autism Network (CAN) provides highly supported sports and recreation programs for children, teens, and young adults living with autism in Kelowna, Kamloops, the Valley, the Lower Mainland, Victoria, Duncan, and Nanaimo. Online registration for CAN’s spring session of multi-week programs will take place from Monday, February 20th at noon, to Friday, February 24th at noon. Not yet a CAN member? Join today for only $25/year at www.canucksautism.ca/join. In collaboration with Surrey Schools and SFU, ACT hosts a monthly support group for South Asian Families raising a child with autism. Come to a meeting and raise your questions; topics are decided on at the meeting, and conversations are held in English and Punjabi. Next Meeting: February 23, 2017 at École Henry Bose Elementary School, 6550 134 Street, Surrey. For more information, see the ASAAP Support Meeting flyer. Please see the Act in Punjabi page for more on the work of ACT’s South Asian Autism Awareness Project (ASAAP) Committee. Feb 1 Autism and Tax – New Westminster, B.C. Feb 4 – 5 Behaviour Interventionist Basics Training Workshop – Nanaimo, B.C. Feb 6 Introduction to Problem Behaviour in Children and Youth with ASD – Squamish, B.C. Feb 7 – 8 Using the SCERTS Framework to Foster Active Engagement in Students with Autism – Richmond, B.C. Starting Feb 7 PEERS: Social Skills Group for Teens with ASD – Vancouver, B.C. Feb 17 – 18 Autism Conference – Richmond, B.C. Feb 17 – 18 Demystifying the Classroom – New Westminster, B.C. Feb 24 – Autism 101 – Prince George, B.C. Feb 25 – Behaviour Interventionist Basics Training Workshop – Prince George, B.C. Participate in Research & Build Knowledge! Are you interested in participating in autism research? Some of the latest projects underway in Canada and internationally are posted on ACT’s website: www.actcommunity.ca/information/research/participate-research/. The Autism and Developmental Disorders Lab invites parents and children age 7-12 with or without ASD to participate in research about how children develop social skills for communication and interaction. Parents and children will work together on fun and interactive activities. Parents receive $30 and parking remuneration in thanks for participating in the 3 hour study. Please contact addl@sfu.ca for more information. This entry was posted in ACT Resources, Autism Information Database, Education and Training, Events, fundraising, Fundraising, Media, News, News Round-Up, Online Videos, RASP news on January 31, 2017 by ACT.